Fruit – very good helpers in maintaining health and beauty, so why not use these properties in combination with excellent taste to their advantage! Fruit water widely used. In the process of cooking, fruit, filtered water, vitamins and minerals, easy to assimilate by the human body. However, consumption of fruit water is a great way to cleanse the body of toxins, filling it with energy that our modern world is particularly necessary. In General, they say that this water really works wonders! Well, check out this is not difficult, after all, to prepare such water will not be difficult! Here are a few ways of cooking. You can use any citrus fruit according to your desire. 1 liter jar of water, usually take one medium-sized lemon and orange. Proportion is also taken based on your taste. 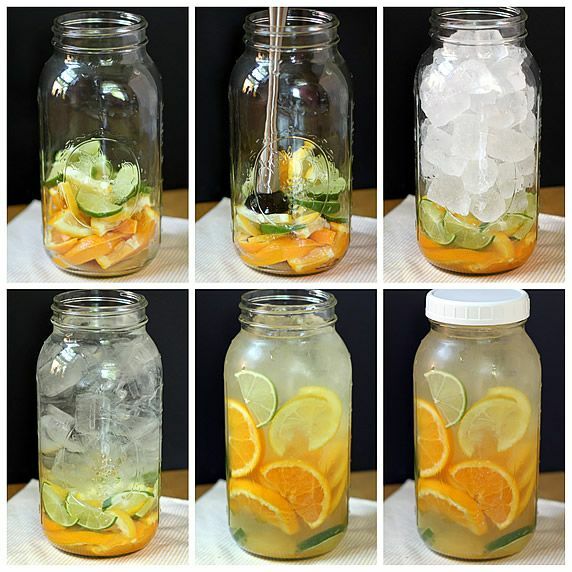 Making that water once, you will realize how much you need of each particular fruit to get a specific taste. fruits cut into slices, their halves or quarters, slightly crushing them in a jar with a wooden spoon. Then add ice cubes and pour water (preferably filtered). Close the jar with a lid and leave for a few hours. During this time, the water will acquire the taste of citrus. In hot weather, this water put in the fridge to quench your thirst and to cool. 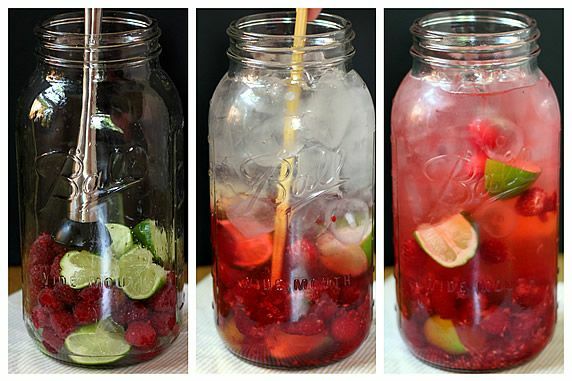 Requires 1 lime and some raspberries in 1 litre of water. Cut lime in half, squeeze out the juice in a jar, and then cut the squeezed halves into slices and lay on the bottom of the jar. Add in a jar of raspberries and lime and mash the berries with a wooden spoon. In this procedure, we need to get the juice, but not to turn the ingredients into the consistency of mashed potatoes. After that, place in a jar of ice and fill with water. Leave the drink for a few hours for the acquisition of the rich taste and bright color. Pineapple peel and cut into small pieces. 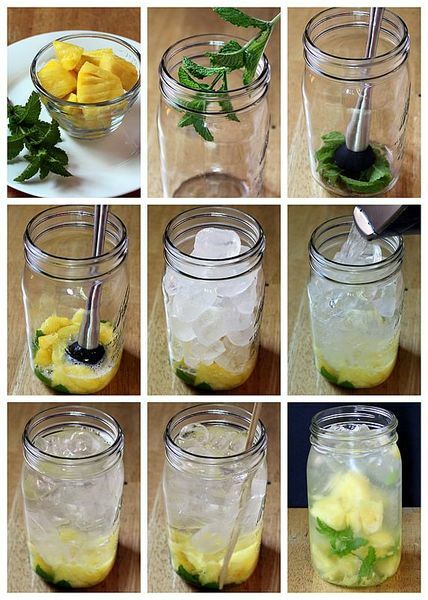 Put in a jar in order, first, the mint leaves, then slices of pineapple. 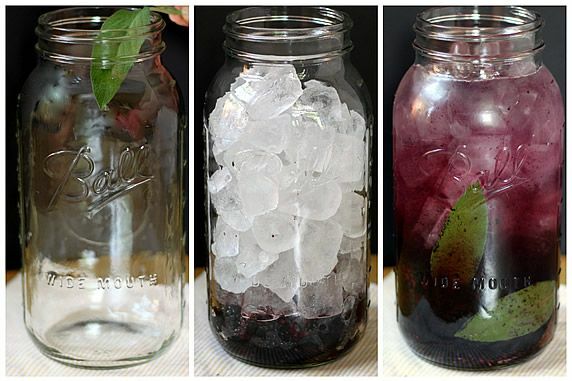 Mash the ingredients in a jar, put ice and fill with water. Let the water stand for several hours. 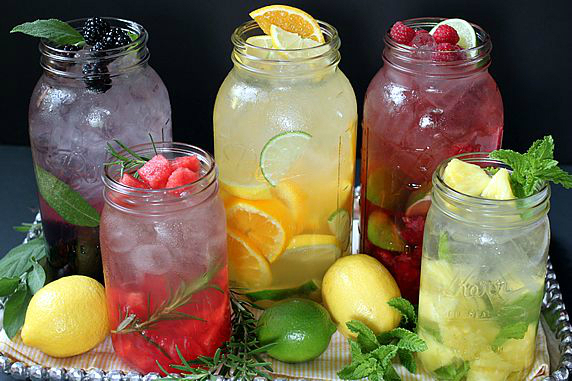 The drink is very refreshing, and also helps to struggle with excess weight! Sage leaves, rinse and put on the bottom of the jar, put on top of the blueberries. With a wooden spoon to mash the ingredients to produce the juice, then put ice and cover with water. Leave for several hours to purchase water taste and aroma. 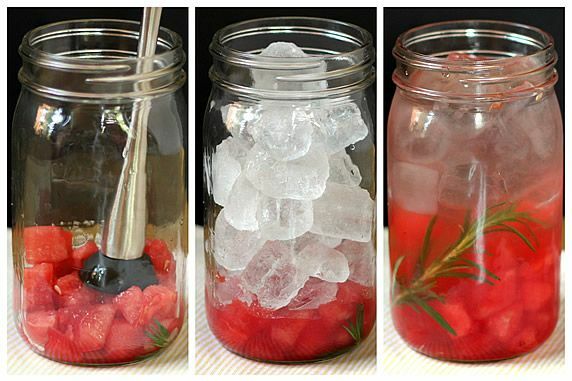 Put in jar rosemary leaves, and then the flesh of the watermelon. Also mash the ingredients until the juice, add ice and fill with clean water. After several hours of enjoying the taste of a delicious and healthy drink! Bon appetite and perfect of health!